Are you a “Viking” and Gamer? If so, Catalyst Game Labs are looking for play testers for their new Vikings: Longships game! Playtesting is always a crucial part of any game development. And it often can be incredibly difficult and time consuming in a lot of ways. Not necessarily for the playtester (though it can, depending upon the game), but for the coordinator/developer that has to wade through so much feedback provided by often dozens of groups and separate the good from the bad and figure out how to weave the best into a better game. Yet there is nothing more effective for making a good game than solid playtesteing. Players take on the role of viking captains raiding the western lands with their new longships. Vikings start at home in Kattegat and will move across open seas and raiding settlements, all the while engaging in combat with the locals and potentially traitorous viking rivals. Above all else, Vikings value fame and fortune gained during these viking raids. Each round players will secretly make offerings from their viking horde for the four phases of viking life – sailing, fighting, raiding, and feasting. Resources come in five generic types, but have specific and variable uses according to their assigned locations. During each phase, players will simultaneously reveal their intention for that action phase. The final round of play begins when any of the longships reaches the finish space. The captain with the most prestige at the end of the game wins. 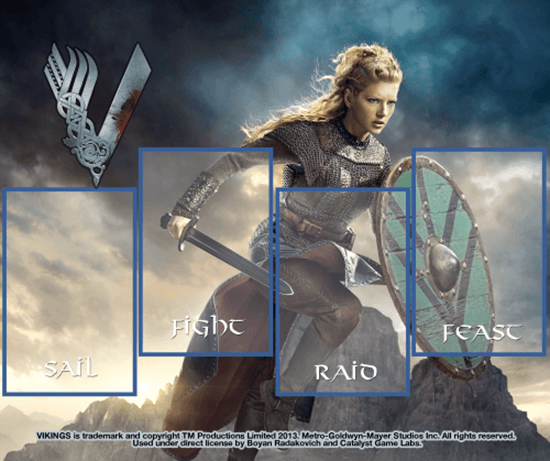 Vikings: Longship is a strategy racing card game with hand management and bluffing elements that plays in roughly 15 to 45 minutes (depending on scenario) and is intended for 3 to 5 players, ages 10 and older. Previous Watch the second Terminator: Genisys Trailer Here!